Posted on March 6, 2015 by Chiara Iacoviello. This entry was posted in Eating Well. Bookmark the permalink. For the first week of the March Culinary Countdown, we looked into the benefits of cooking at home with dietitian Ben Atkinson, who manages Harborview Medical Center’s outpatient nutrition, informatics, and wellness programs in the Nutrition and Foodservices department. Eating homemade foods is usually much cheaper than eating at a restaurant or buying processed foods from the market. Plan several days of meals. We’ll be less likely be tempted to eat something else if we have a plan or something already made. Make a grocery list and stick to it to avoid buying extra food. Save leftovers in the refrigerator or freezer. Once you get a stock of leftovers stored, you can reheat them at a later date when you don’t have time to cook. It might seem like grabbing something to eat at the local supermarket or driving to get take-out at the closest restaurant might be a quick solution when you’re in a hurry. In reality, many times it can be much faster to cook something at home, especially when you plan ahead. There are so many meals that can be made in less than 30 minutes. And if you choose a more complex recipe, you can always cook in bulk and eat the surplus later in the week or freeze it. Many commercially prepared foods are high in fat, salt, and sugar. When we prepare our own food, we know exactly which ingredients and how much of each are going into our food. Preparing your food at home can be especially beneficial if you or a family member has a food allergy. Because you are in control in your own kitchen, you can reduce the risk of an allergic reaction. Many restaurants and fast food joints offer portions that are much larger than necessary. And the problem is, when food is in front of you, chances are you’ll eat it. When you dine in, you can regulate the amount of food served for dinner, eliminating unnecessary temptation. Eating at home gives the entire family time to talk about their day. Involving your children in food preparation (maybe by asking them to read the recipe out loud or mix ingredients) is not only a fun thing to do, but also a great way to teach them healthy eating habits. In Italy we normally eat frittata for lunch or dinner, but these would be equally delicious for breakfast. The great thing about these frittatas is that they can be made in advance; just reheat in the microwave or eat at room temperature for a quick and healthy go-to meal. Ben’s advice: “You probably saw the recent scientific advice for the upcoming Dietary Guidelines 2015 revision—the one that said eggs weren’t bad for your health. Well, it’s true. Besides their great amount of protein, eggs have healthy omega-3 fats. They are also a nice source of Vitamin B12 for people who don’t eat meat. These frittatas are the rare breakfast menu item that contains large amounts of vegetables, too. Pair them with a slice of whole-grain toast or a piece of fresh fruit, and you’ve got a delicious and balanced meal. Coat 4 small baking dishes with cooking spray. Set aside. Heat olive oil in a large pan over medium heat. Cook leek until soft, 2 to 3 minutes. Add spinach and cook 3 to 4 minutes. Drain in a colander and squeeze out excess water. Lightly whisk eggs in a bowl. Stir in ricotta, Swiss cheese and Parmigiano Reggiano cheese, spinach mixture, salt and pepper. 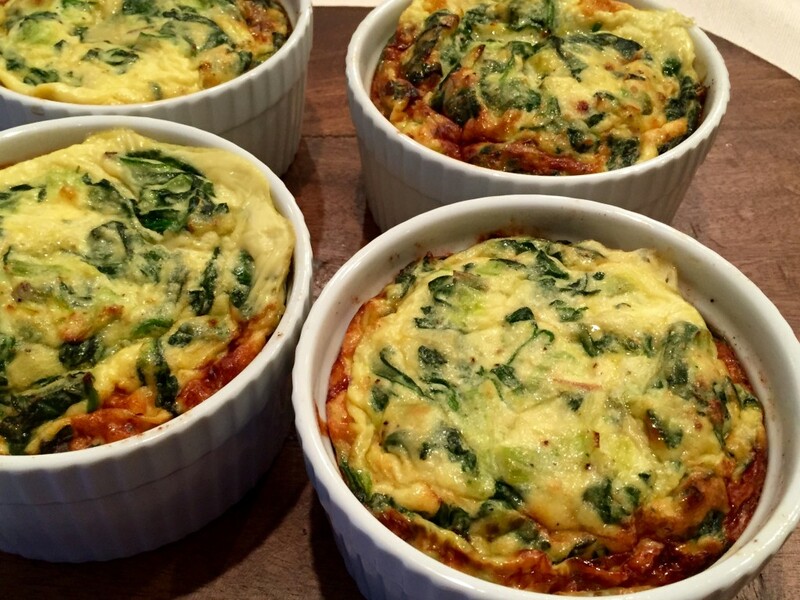 Spoon into baking dishes; bake about 20 minutes, or until eggs fluff up and top is lightly browned. I love spinach, but feel free to experiment with your favorite ingredients. This is my family’s pesto recipe. Why buy store-bought pesto when you can have superior results by making it yourself? Make a bigger batch during summer months when basil is in season and freeze it in small containers to have pesto year-round. It’s delicious on pasta, pizza, and sandwiches. Combine basil, garlic, and pine nuts in a food processor and pulse a few times until finely chopped. Add cheese and process until combined. While the food processor is on, add the olive oil in a stream, until fully incorporated and smooth. Once the water is boiling, add pasta and cook until al dente. Drain, reserving 1 cup of water. 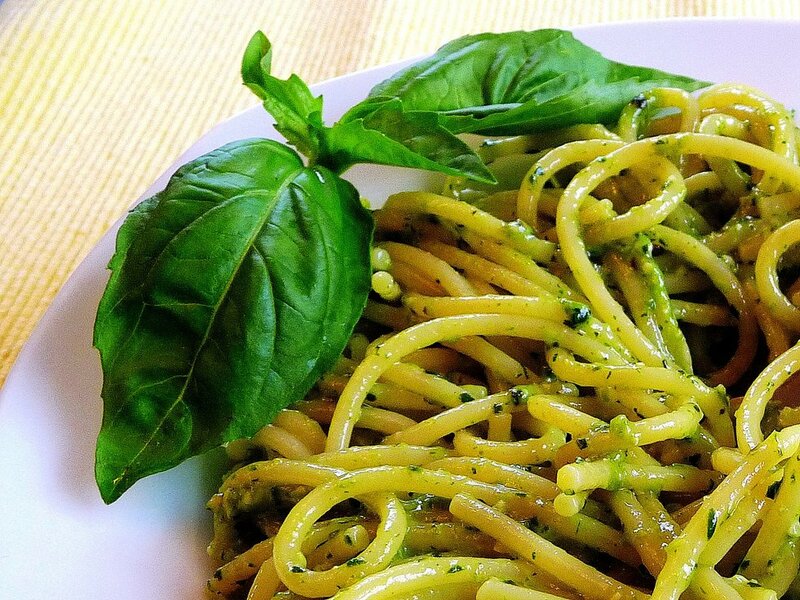 Place pasta in a large bowl and incorporate pesto. If the consistency of the pesto is too thick, add some of the reserved cooking water. Toss well and serve immediately. Homemade tomato sauce is so much tastier and healthier than its store-bought counterpart. Make a big batch of fresh tomato sauce — especially July through October when tomatoes are in season — and freeze. Gnocchi takes literally two minutes to cook and is perfect for days when you’re pressed for time. With a knife, cut a shallow ‘x’ on the bottom of the tomatoes and once the water is boiling, plunge them in the hot water and let sit for 30 seconds to 1 minute, until the skin starts peeling. Remove the tomatoes and rinse them quickly under running cold water. With a knife, peel away the skin. Cut the tomatoes in half, then cut around the crowns and remove them. Squeeze out the seeds and excess water. Chop the tomatoes. Heat the oil in a pot. Add garlic and brown. Add the tomatoes and a big pinch of salt. Cook for about 15 minutes, until most of the water has evaporated, turning with a wooden spoon a few times. In the meanwhile, bring a large pot of salted water to a boil. Once the water is boiling, add gnocchi. They are ready when they start floating on the surface, about 2 minutes. 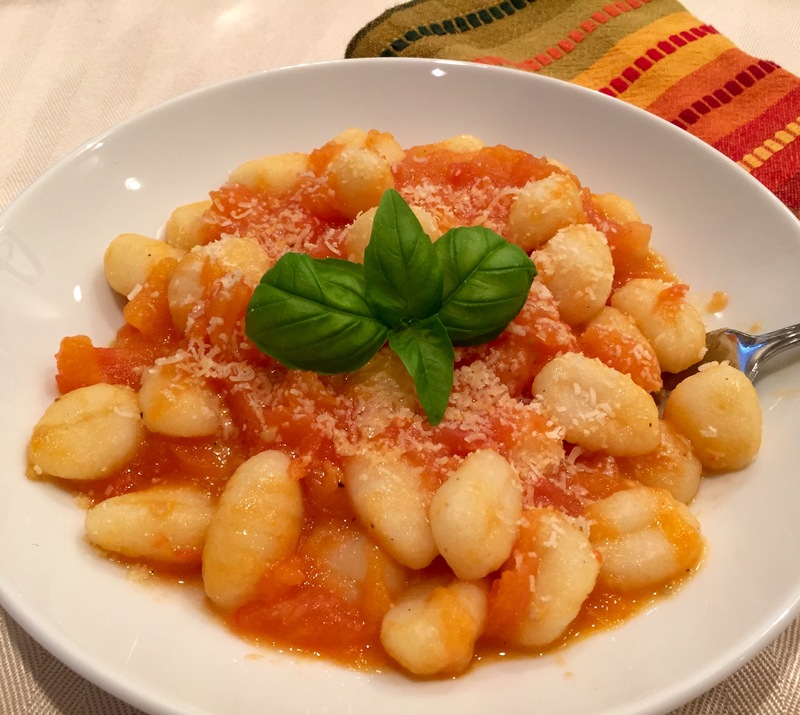 Drain gnocchi well and toss with tomato sauce. Add basil leaves, torn roughly with your hands. Sprinkle with Parmigiano Reggiano and serve. 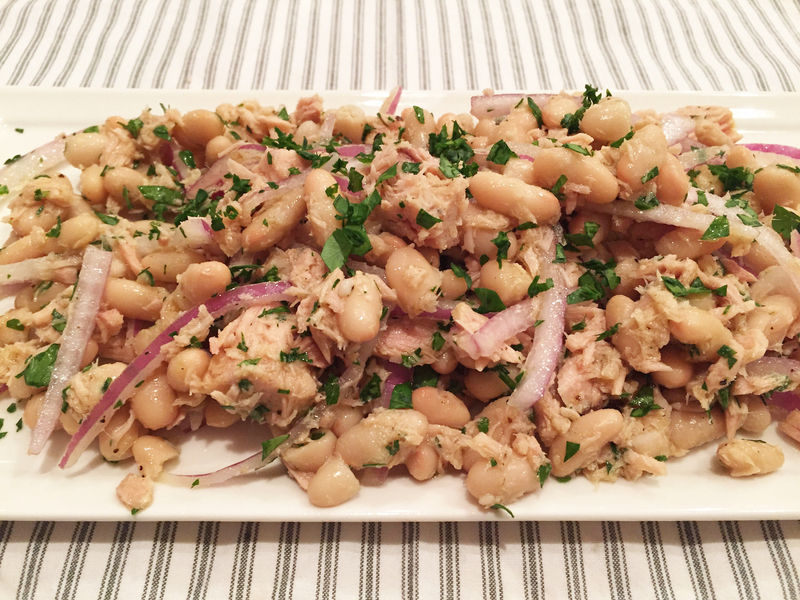 Mix beans, onions, and olive oil in a shallow serving dish. Season with salt and pepper and toss well. Break the tuna into bite-sized pieces and add to beans. Add parsley, mix well, and serve. In Italy, we eat this salad as a side dish but it can very easily become a main dish when you add a couple slices of grilled bread or grilled chicken breast. To make the vinaigrette, pour olive oil and vinegar in a small bowl. Add salt and pepper to taste and mix well with a fork or whisk. Peel the pears and cut them into small cubes. 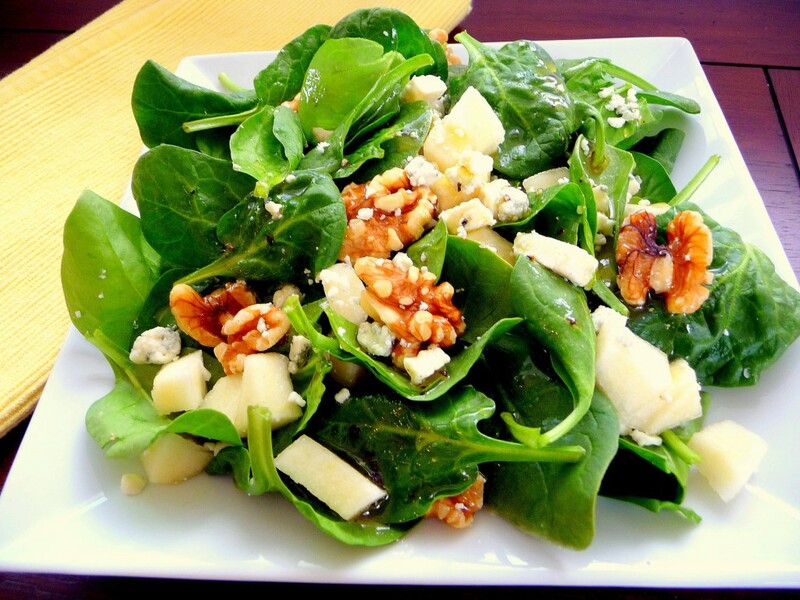 Place spinach in big bowl and add cubed pears, walnuts, and crumbled Gorgonzola. Pour vinaigrette over the salad. Toss well and transfer to small individual plates. This is one of my favorite meat dishes. It is extremely easy to make, tastes great, and looks beautiful. Arrange arugula on a platter. Heat olive oil in a large pan over medium-high heat and cook garlic until golden. Discard garlic and add meat to the pan at once. Add salt and pepper and toss with tongs to color evenly, for about 1 minute. 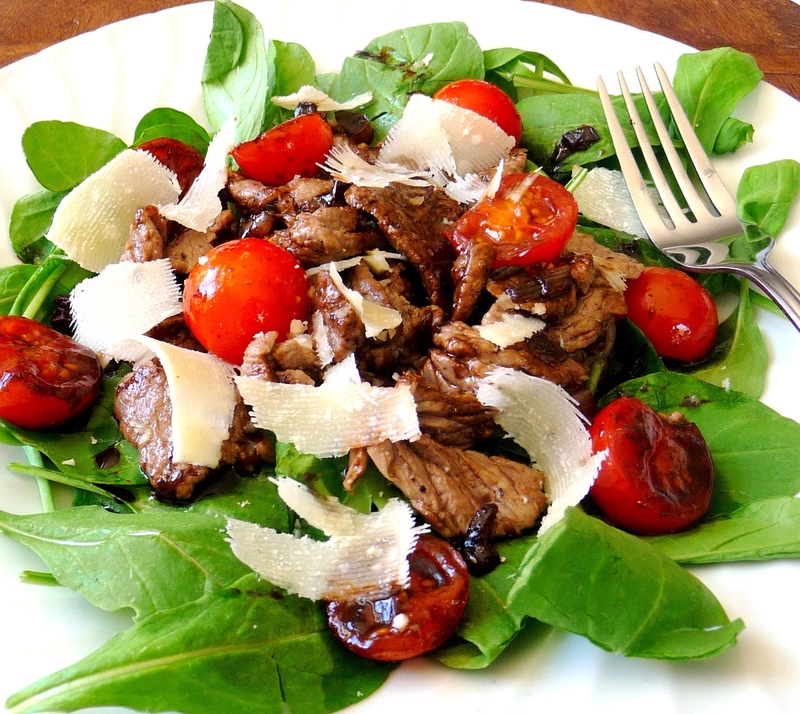 Arrange steak over arugula. Add shallots and vinegar to the pan and cook for 1 minute on medium heat. Add the tomatoes and cook for another minute, until the sauce has slightly thickened. Add salt and pepper. Pour dressing over steak, cover with shaved Parmigiano and serve immediately. 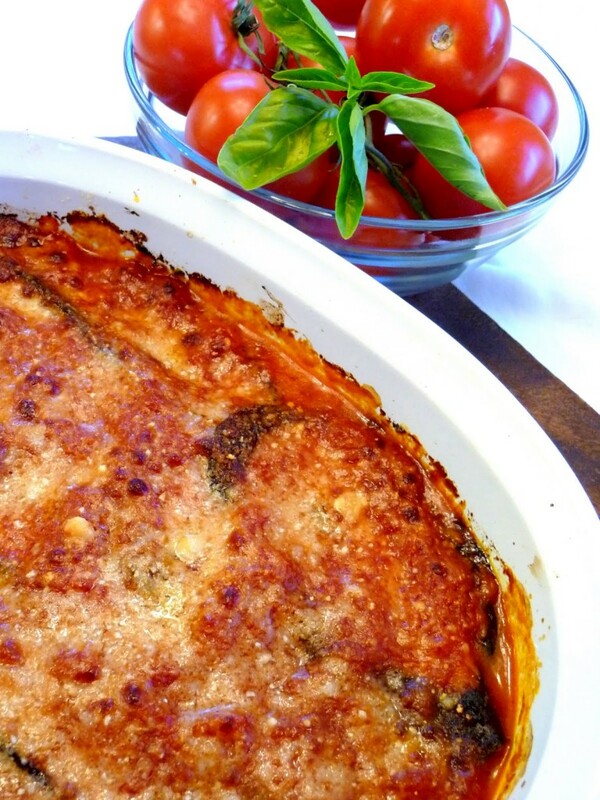 This much healthier version of traditional Parmigiana uses grilled instead of fried eggplant. The best way to enjoy Eggplant Parmigiana is to make it the day before, and let the flavors develop. Cut the eggplant lengthwise, into ¼-inch slices. Layer the slices in a large colander and sprinkle each layer with salt. Cover the eggplant slices with a small plate and weigh them down by placing something heavy, like a can of tomatoes, on the plate. Let the eggplant rest for at least 1 hour, so that it can expel its bitter juice. Rinse under running water and pat dry with paper towel. While the eggplant is draining, prepare the tomato sauce. Heat a couple tablespoons of olive oil in a saucepan, brown the garlic cloves, and add the tomatoes. Cook for about 15 minutes and season with salt and pepper. Preheat the oven at 350°F. Place the eggplant slices in 1 layer on a baking sheet and bake for about 15 minutes. Spread a few tablespoons of tomato sauce on the bottom of a 13×8-inch baking dish. Arrange the slices of eggplant in 1 layer over the sauce. Top with a few more tablespoons of sauce, some mozzarella and some Parmigiano. Sprinkle a few basil leaves on top. Continue layering until you run out of eggplant and top the last layer of eggplant with sauce and Parmigiano. Bake for about 40 minutes, until the cheese has melted and the top is slightly browned. Remove from the oven and let cool for 10 minutes before serving. I hope you enjoy cooking more often this week. Share pics of these meals or your own recipes in the private Eating Well group for a chance to win a Whole U apron! 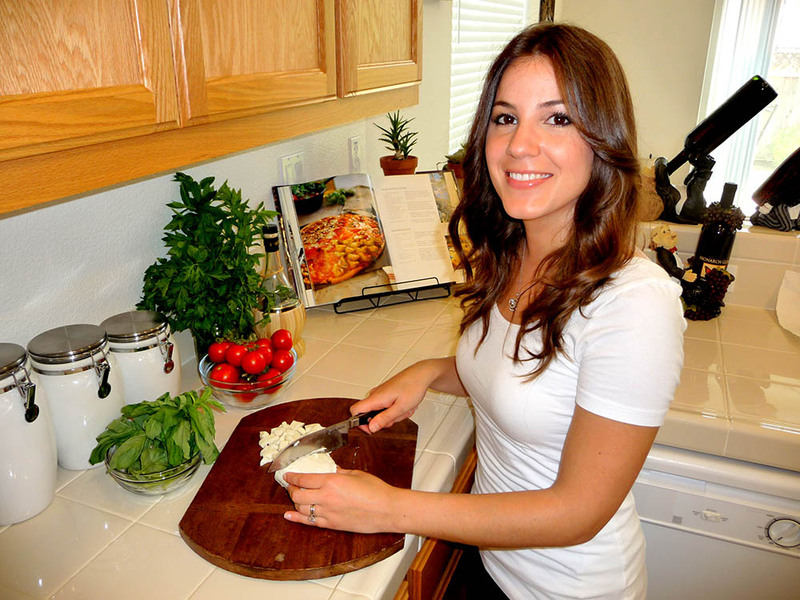 Chiara Iacoviello is a marketing and events consultant for The Whole U and a former culinary business owner and chef at the Andretti Winery in Napa, California. 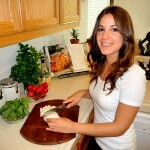 She’s a native of Italy who learned to cook authentic Italian cuisine from her parents and grandparents. 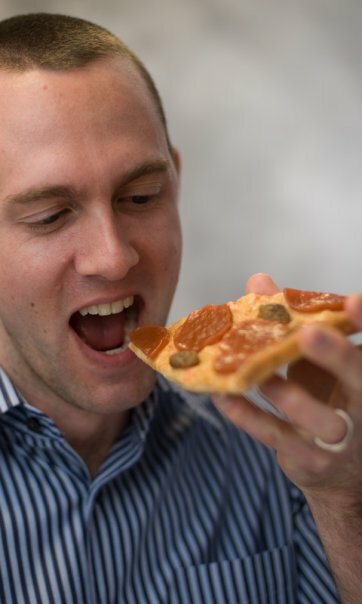 Ben Atkinson is a dietitian at Harborview Medical Center, where he manages the outpatient nutrition, informatics, and wellness programs in the Nutrition and Foodservices department. He enjoys riding his bike with his family, learning New Jack Swing dance with his kids, and polishing his dress shoes. I am looking forward to some recipes that do not include dairy or rely mainly on carbs/protein for their bulk. My anti-inflammatory approach to eating emphasizes fruits and vegetables (preferably 2/3 of most meals). Eggs and veggies are my breakfast mainstay – sans dairy. Hi Judith, you might like week 3 recipes…lots of quinoa & veggies! Yum, but out of all of the recipes, I would only be able to eat one :-(. All with the exception of the tuna dish and the spinach salad had parmesan cheese in them – the spinach salad has walnuts, which I’m allergic to and Parmesan, even though I, too am Italian and love the flavor of Parmesan, gives me migraines. Hope there will be some recipes next time that I can eat. Hi! I’m sorry to hear you can’t eat Parmesan! A few of the recipes will work just as well if you don’t include it. 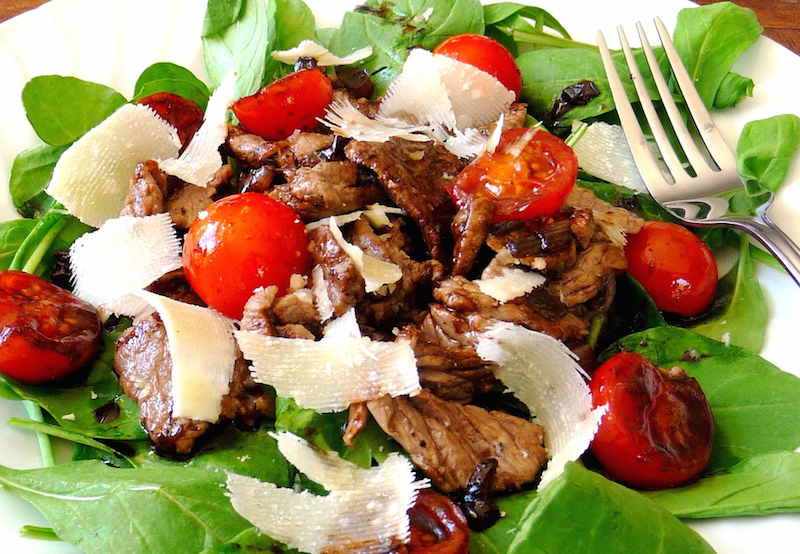 The beef strips salad, the gnocchi and the mini-frittatas don’t really require Parmesan. They will taste just as good without! How about a print friendly link to these recipes (without pictures and extras) for easier transition to use in my kitchen? Kate, that’s a great idea! Thank you! I’ll see if our designer can do that for us. These look amazing. I love the two takes on each dish. It’ more fun to read this way. It would be helpful if the recipes could include nutrition facts. We have a family member with Hypertension and must watch sodium consumption and also is gluten sensitive. Some things are easy to substitute low sodium items I cook fresh tomatoes instead of using canned. It does make cooking a challenge. any suggestions? Hi Lori, you are right. Choosing fresh or frozen instead of canned items is a great way to limit your sodium intake. A great way to introduce additional flavor to your foods is to use herbs and spices. They will add flavor without the extra sodium. We’ll look into adding nutritional facts next time we do a challenge like this. Thanks for your input! I think all these recipes are highly adaptable–for instance if you can’t eat cheese, it’s easily left out without feeling like you’re missing anything. I’m wondering what to replace the red onion with in the tuna dish though; any raw onions give hubby some serious heartburn. 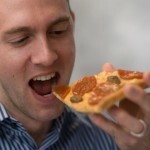 Only thing I can think of so far is capers (which I may throw in regardless), but I definitely want something that can help stand in place of that excellent bite and crunch onions provide… what do you think? Hi Hannah, how about sliced radishes? They definitely don’t have the same flavor as onions, but they do have that nice bite and crunchiness you are looking for. I am motivated by pictures of how delicious the recipe looks after it has been prepared. I’d like to see a print friendly version = entire recipe on the same page, including the photo. Hi Carol, I’ll let our designer know and I’ll see what we can do!